The 1887 Church of the Nativity incorporated the original 1865 structure, its belfry facing Wyandotte St. In 1791, the discovery of anthracite coal in Carbon County, attracted predominantly Welsh and Irish coal miners—by 1833, they had built the Lehigh Coal and Navigation Canal to completion. Barge builder and wealthy politician, Asa Packer believed that a steam-driven railroad could transport coal faster. Packer hired an Irish workforce to build the Lehigh Valley Railroad along the Lehigh River—and by 1855, the first coal cars passed through Bethlehem South at the North Penn Railroad Junction. After the Civil War in 1865, the village of Bethlehem South had become the Borough of South Bethlehem. Evidence of Asa Packer’s influence on the fledgling town was clearly visible: a diverse population of workers in the iron industry; the growth of an affluent Fountain Hill neighborhood, home to the industrial entrepreneurs; and through Lehigh University on South Mountain—a polytechnic institute founded by Packer. 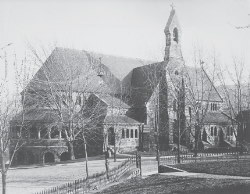 A resident of Mauch Chunk, Packer financially supported St. Mark’s Episcopal Church. Inspired by his faith, South Bethlehem industrial businessmen, relatives and vestrymen saw the need for their own Episcopal Church. These individuals included Robert H. Sayre, William H. Sayre, Tinsley Jeter, Garrett B. Linderman, Ira Cortright, Samuel Wetherill, John Smylie, Jr., Dr. Frederick A. Martin and E.P. Wilbur. By 1865, the slate-covered stone Church of the Nativity was consecrated by Rev. William Bacon Stevens (1815-1887), Bishop of the Episcopal Diocese in Philadelphia. On Easter Sunday, 1887, the Church of the Nativity was enlarged. Architect C. M. Burns designed it parallel to Wyandotte St. and incorporated the earlier 1865 stone church, making efficient use of the site. Included among the members of Church of the Nativity were a “Colored Congregation,” black individuals employed as servants and coachmen by the same Fountain Hill church founders. In 1901, the black congregation had acquired enough capital to build their own church on Pawnee St. in Fountain Hill, at that time under the pastoral leadership of Rev. C.H. Brown. St. John African Methodist Episcopal (A.M.E.) Zion Church, still exists today. In 1891, John Fritz founded and endowed the Fritz Memorial Methodist Church at Packer Ave. and Chestnut St. (now Montclair Ave.) and dedicated it to his parents; today the church continues to serve its South Side congregation.